Have you seen the new Simrad Halo Radar system paired with NSS Evo3 with SolarMax screen technology? Simrad makes it easy to mark other vessels or obstructions, lightning, weather or birds with pre-loaded settings. With a touch of a button, you can choose from Harbor, Offshore, Weather, Lightning or Bird settings for each marking purpose. Additionally, you can create a button with your own custom settings for even more flexibility. SolarMax screen technology allows you to see the screen even in the brightest sun with your sunglasses on. Without a doubt, radar technology continues to improve. 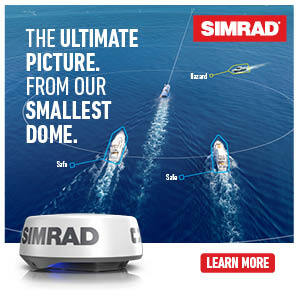 With Simrad, you can go with confidence in knowing that you have the very best.